To whom it may concern: The project is now officially in legacy mode. This is very similar to how Microsoft turns their products in to legacy products, as development and planning has ceased. It's been 2 years, can't say it's been fun, but it was a thing and I'll never forget it. Thanks to all the great users who have submitted detailed and thorough bug reports. Don't know if you're interested in addressing this, but I found a little bug. 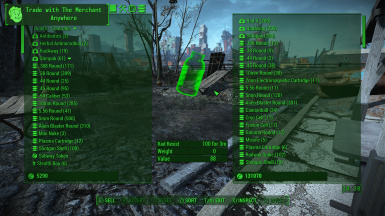 Far Harbor adds a 4th rank of the Rad Resistant perk, and Cheat Terminal only covers 3 ranks. I had all 4 ranks of Rad Resistant and attempted to use Cheat Terminal to remove it completely. My rad resistance dropped, but the perk list and chart still showed that I had all 4 ranks of the perk. I suppose it would mean expanding Cheat Terminal to cover the DLCs. 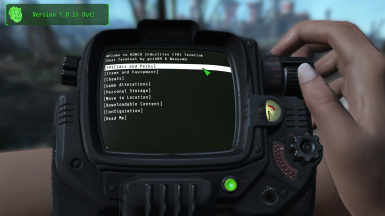 Integrating the same functions as http://www.nexusmods.com/newvegas/mods/49152/? Okay, so LOVE this mod. Question...I found the Chinese Assault Rifle in the mod once but can't seem to find it now. Anyone know what tab it is under? I've got a problem. 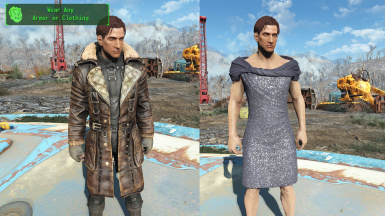 Trying to get back into FO4 after having been away for a while and decided to update this absolutely essential mod to the latest version. Only it doesn't seem to be working. The mod is installed and I have even re-installed it but the holotape isn't appearing in my inventory and the game doesn't seem to recognize it at all. Can anyone help me figure out what I'm doing wrong? Thank you. Does this have an option for "Always Pass Speech Checks"? Sorry to ask, but I don't see it anywhere on the mod page. 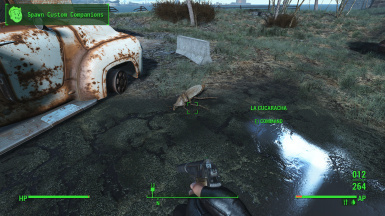 Every time i play a Bethesda game without this mod I feel like I have a missing limb. 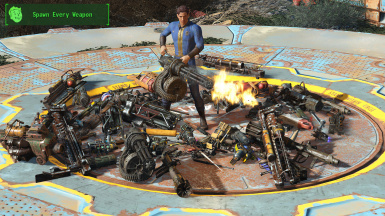 Hello, I found a pretty bad bug with power armor and the infinite items cheat. If I enable infinite items and get in and out of power armor, then get in and out of it a second time, the fusion core disappears from the PA and I have to put another one in. One character I have can use a fc only once. 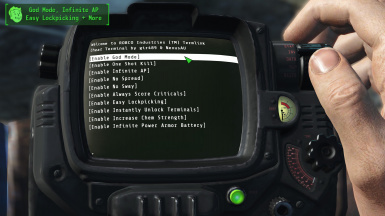 If I disable infinite items cheat, the bug is still there and even disabling the mod and clean saves won't work. The fusion core is new and I tested by disabling all mods but this on a new character. It seems to happen after moving around in PA with infinite items enabled. Make sure infinite items is disabled. Get an empty frame along with your normal PA and try getting in and out between them, put a fc in one without getting in it and get in the other one. Eventually it will work, you just have to go back and forth a bit. Very strange, but I'm glad I found a solution. This has been fixed in 1.65. Thank you for your detailed report. You have the holo tape right ? 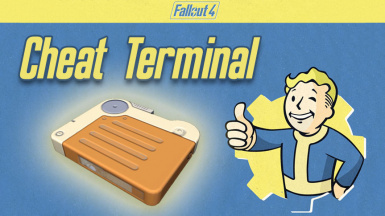 are you able to at least put it in your pip boy ? Does anyone know how to add mods to the Cheat Terminal. I can't find the lever action rifle in the weapon items category. Does the cheat terminal not have it? Nope its not there, just looked myself ..
Nevermind, I found it. It's located in the DLC weapons category.